If you are staying overnight on the Islands you may want to use the services of one of the local outfitters or charter companies listed below. 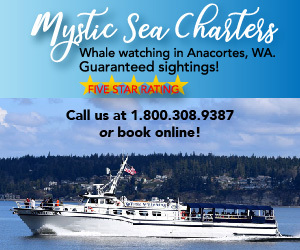 If you want to go whale watching as a day trip from elsewhere in the Puget Sound region, then please go to Mainland Charters and Tours. Also, some operators have departures from both the islands and the mainland. Remember, whale watching is a popular activity and it is a good idea to call ahead and make reservations in advance of the date you might want to join a whale watching cruise. Personalized Whale Watching and Wildlife Trips. Hop aboard one of Outer Island Expeditions' custom high-speed aluminum vessels for an up close and personal experience. All our vessels have an enclosed cabin and restroom. We have scheduled trips and custom private trips. We can accommodate singles, couples, families, and larger groups (up to 24 people). Our fast vessels mean you spend more time with the whales and wildlife. All our trips are led by trained naturalists. Check out our website for more details: www.outerislandx.com. Please contact us at (360) 376-3711 or outerislandx@hotmail.com with any question or to book your trip. Our Guarantee: We see orca whales on over 90% of our tours. If you do not see orca whales on your tour, then your next tour is free of charge. Cruise in comfort aboard the classic motor yacht 'Odyssey' with certified Naturalist guides. Enjoy heated lounge style cabins and outside viewing decks with padded seating while viewing orca whales, sea lions, seals, porpoise, bald eagles and a variety of sea birds in their natural habitat. Two amazing certified Naturists will be on board to share information about the flora, fauna and Salish Sea region. Carbon neutral business and locally owned operated by second generation islanders. Established 1994. San Juan Cruises. Friday Harbor, San Juan Island, WA. Phone: 360-378-3499; Toll-free: 1-800-232-ORCA (6722).